A Winnipeg high school principal reached into her Inuit background to help write her first book. Batzel will launch the book on Nov. 2 at McNally Robinson book store in Winnipeg. And if there’s a demand, she’s hoping to travel to various Manitoba communities after that to promote it further. But any book promotions outside of her hometown would have to be done on weekends as she is the principal at Winnipeg’s Children Of The Earth High School. “What’s In A Name?” is a story geared at children ages seven to 14. The story focuses on Inuit heritage and how a city boy Adjuk (Batzel’s real life son who is now 20) was named after his great grandfather, who grew up in Nunavut. “Everyone can relate to being named after someone,” Batzel said. Batzel hopes the book inspires others to learn about the meaning of their names. She also hopes readers will get a better understanding of who they are and where they came from. Batzel, 47, was born in Churchill, Man. but her birth mother exited her life soon after Batzel was born. Her birth mother suffered for many years because of her residential school experiences and felt her daughter would have better opportunities with another family. Batzel, who was born several weeks premature, only weighed about three pounds and six ounces at birth. After eventually being released from hospital, Batzel believes she spent some time in a foster home before being adopted by a Winnipeg couple when she was five months old. “They had two boys of their own and they wanted a girl,” Batzel said of the couple who adopted her. As she grew older and more inquisitive about her past, Batzel’s adoptive parents were fully supportive of her seeking information on her birth parents. 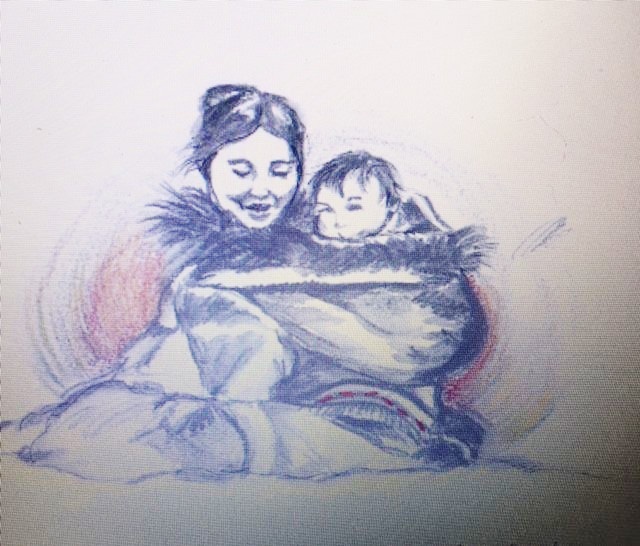 When she was 21, Batzel found her biological mother, who still lives in Nunavut. Batzel also eventually found her birth father, who was Caucasian, in La Pas, Man. He died last year. Batzel continues to maintain a close relationship with her birth mother these days. “What’s In A Name?” is illustrated by Heather Korlak, a North Vancouver-based teacher, artist and expressive arts therapist. While Batzel’s debut book touches on Inuit heritage, she said plenty of other Inuit-related stories have been passed down to her, which could be turned into future books. But she’s unsure if writing another book is in her future. “It might be a possibility, especially if this book is well received and Heather is willing to do the illustrations again,” she said. She wrote a story for “Manitowapow: Aboriginal Writings from Land and Water”, an anthology of Aboriginal writings from Manitoba, which was published in 2012.